WatchSeries-Online.eu Domain “Hijacked” – Or Was It? 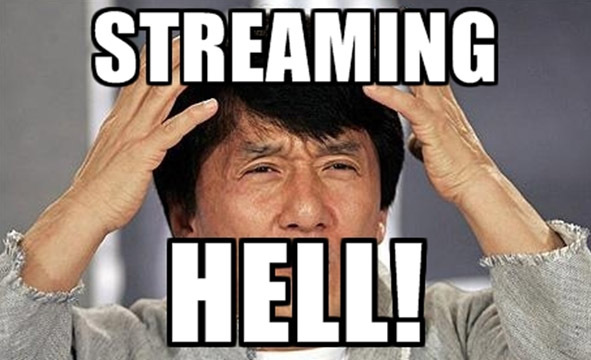 The domain of a large streaming TV show site was hijacked yesterday and began diverting to an imposter site. That's the claim from WatchSeries-Online.ch, a site that in its previous form had been riding up towards the Alexa 1000. But is the real story as straightforward as that? Typically of these sites, absolutely not. During the past few years alongside the advent of cheap online storage, sites linking to streaming video lockers have appeared in their dozens. These sites index links to popular movies and TV shows and present them in a professional looking manner. Due to their simplicity they have become incredibly popular but for some reason security is sometimes their Achilles’ heel. For reasons that aren’t clear, these sites are more vulnerable than most to hostile takeover from rivals intent on taking their business away. Just how easy is it to take over a site with many millions of visitors every month? As previously reported, it’s pretty easy, and today another site can add its woes to the long list. This episode, just like many before it, is about to get stupidly complicated. WatchSeries-Online.eu has been steadily growing in popularity for a couple of years now, providing in-browser access to a wide range of TV episode content. Yesterday, however, the site appeared to lose control of its own domain, at least that’s what a person claiming to be its owner told TorrentFreak. Currently the WatchSeries-Online.eu domain diverts to a new domain, WatchSeriesHD.eu. That domain was registered yesterday and then modified just minutes after the alleged “hijacking”. Most visitors to WatchSeriesHD.eu probably won’t notice anything different since it looks pretty much identical to WatchSeries-Online.eu. However, there are some differences behind the scenes. 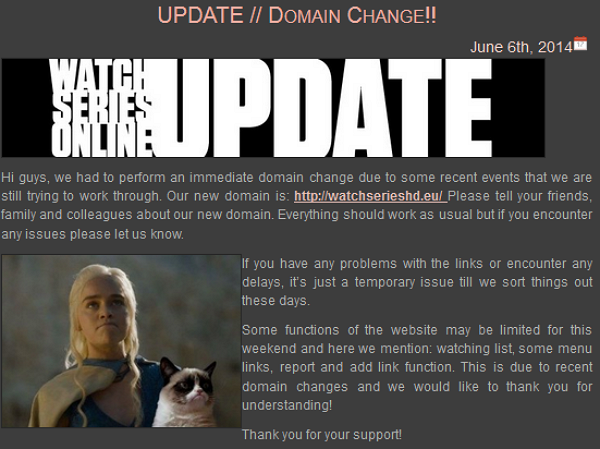 The site that previously operated from WatchSeries-Online.eu now appears to be operating from a brand new domain – WatchSeries-Online.ch. Another early sign that this might be the real deal is the amount of traffic being logged to it by Alexa, despite losing its original domain. In summary, WatchSeries-Online.ch is claiming to be a) real and b) the victim of a hijacking. They also warn that WatchSeriesHD.eu is a fake. But that’s not where this story ends, not by a long way. TorrentFreak contacted WatchSeries-Online.ch (the claimed victim) who told us that they’d been hijacked and asked us to tell people not to use WatchSeriesHD.eu. That was pretty much it. We also contacted the owner of WatchSeriesHD.eu (the alleged fake site) and interestingly he had a much more detailed explanation of what has been going on this past 24 hours. In fact, what that guy told us turns the story completely on its head. The operator of WatchSeriesHD.eu says that the person currently in control of WatchSeries-Online.ch is a former employee of his company, Ernst & Clarke LLP. “[The former employee] was dealing with domain and hosting management and all this technical stuff, because my knowledge is limited in this field,” he told TF. According to the boss of Ernst & Clarke, when his employee left the company he took the WatchSeries-Online.eu domain with him having registered it for Ernst & Clarke but using his own domain registrar account. However, since that domain was company property, it is now back in Ernst & Clarke’s hands having been reclaimed from the registrar, its owner says. “I have just claimed the domain name since it belongs to my company,” TF was informed. Reportedly the former employee was also in control of hosting, so he effectively took control of the real site’s code and database too, even though he subsequently lost control of the WatchSeries-Online.eu domain. However, Ernst & Clarke had a site backup. In the meantime, WatchSeries-Online.ch (the site reportedly operated by the former employee) is trying to regain control of the WatchSeries-Online.eu domain. “We’re working on it and we are confident that we will regain full control of the domain very soon,” the site said in a statement. TF requests for comment on the allegations of Ernst & Clarke went unanswered. History shows us that these takeovers and disputes often cascade into confusion so great that in a few weeks, days, minutes – or even right now – few will know which is the real site and which is the fake. Stories don’t get much more complicated than this and picking through the debris only makes it worse. c There are 20 comments. Add yours?